Rediff.com » News » These countries don't have an army! These countries don't have an army! As the world's smallest state at an area of approximately 110 acres, and a population of just over 800 people, Vatican City has no armed forces. Though, there have been numerous military groups created to protect the country, and most importantly, the Pope. 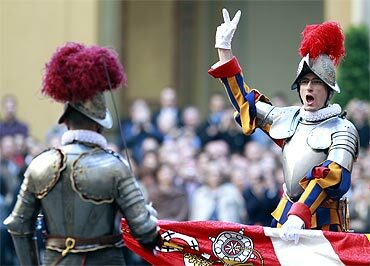 Currently, the group assigned this task is the Pontifical Swiss Guard. Tucked cozily between Switzerland and Austria, Liechtenstein, with an area of around 160 kilometres, is the richest German-speaking country in the world. Liechtenstein has a policy of neutrality, and maintains no military. The country had abolished its army in 1868, after the Austro-Prussian war. 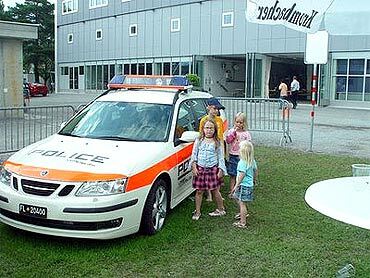 The Liechtenstein National Police is responsible for keeping order within the country. In case of a war, the country can assemble an army. In any case, the police maintains a trilateral treaty with Austria and Switzerland, which enables cross-border cooperation of police forces from the three countries. 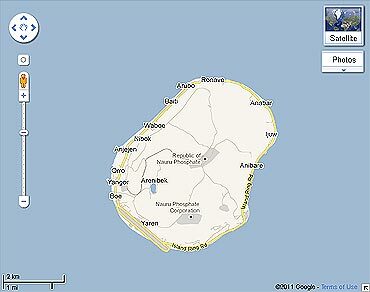 Nauru is the world's smallest island nation in the western Pacific Ocean, covering only 21 square kilometers. It maintains no defence forces, though they have a Nauru police force, which ensures order in the tiny island country. Under an informal agreement, defence is the responsibility of Australia. With a population of about 62,000, Marshall Islands is in the middle of the Pacific Ocean, just north of the Equator. It was granted the status of a sovereign nation in 1983 under a Compact of Free Association with the United States. 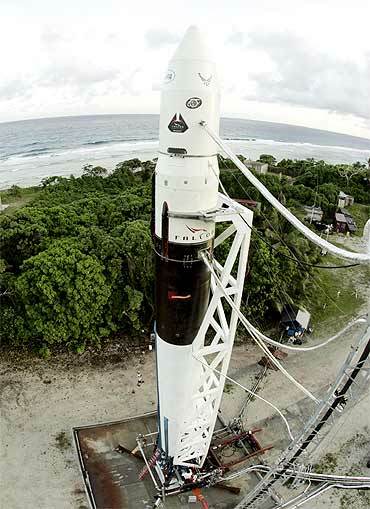 Under the agreement, the US would provide aid to the islands, in exchange for continued US military use of its missile testing range at one of its islands. 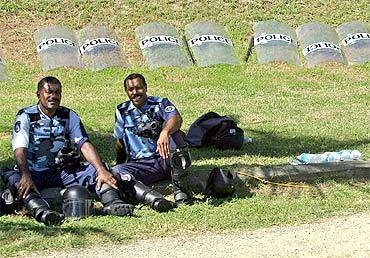 The country has the Marshall Island police, to carry out common police duties in the country. Grenada, known as the 'Island of Spice' is a tiny country located northwest of the islands of Trinidad and Tobago. In 1983, the United States led an invasion of the then Communist country because of a coup and a power struggle that led to the execution of its prime minister. The US was worried that the country would be used by the Soviets as a refueling stop for airplanes loaded with weapons destined for communist insurgents in Central America. After the invasion, the country turned into a democratic nation, and had not had a military ever since. The country relies on its very own Royal Grenada Police Force for policing in the country. 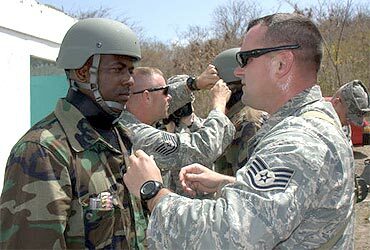 Grenada co operates closely with the US in fighting anti-narcotics and other crimes. 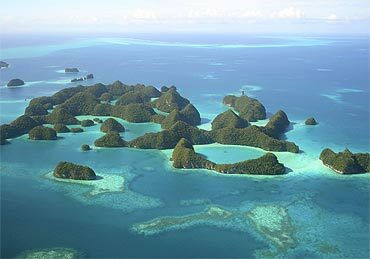 Palau is an island nation in the Pacific Ocean, and one of the world's youngest and smallest sovereign nations. It does not have any military force, but has a Palau National Police Force to carry out common police duties in the country. In case of an attack, Palau will be protected by the United States, under an agreement. Being the sixth smallest nation in Europe did not stop this country from declaring war on Germany in 1914, with just a 10-man strong army! 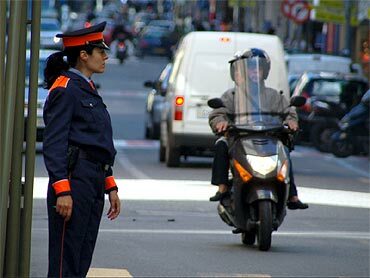 In later years, this army was replaced by the Andorran National Police. If you own a gun, you are required to join this force! Andorra is a full member of the United Nations, and has three protectors -- France and Spain, and the North Atlantic Treaty Organisation. Samoa is a country encompassing the western part of the Samoan Islands in the South Pacific Ocean. It has no formal military of armed forces, but and mostly relies on New Zealand. The Solomon Islands consist of nearly a thousand islands, covering a landmass of 28,000 square kilometers. They are a constitutional monarchy, with Queen Elizabeth II as the head of the state. Between 1998-2006, a civil war left the country nearly bankrupt, so much so that the country's growth rate dropped to just 1 per cent. To resolve these issues, Australia and New Zealand stepped in to restore peace. 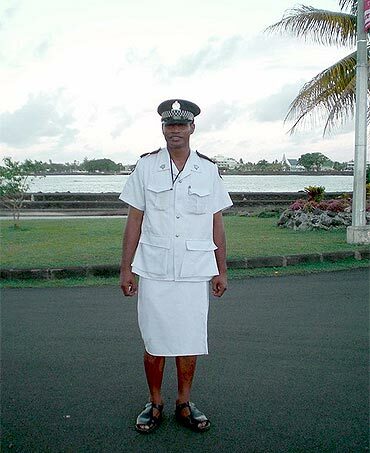 Eventually, the Solomon Islands Police Force was formed. In case of a war, the countries to step forward to help would be New Zealand and Australia. This Central American country which enjoys the title of 'The greenest country in the world' saw a 44-day civil war in 1948, which left almost 2,000 dead. Following the end of the war, the President at that time, officially abolished its Army in 1948. The country has not had a formal standing army ever since. 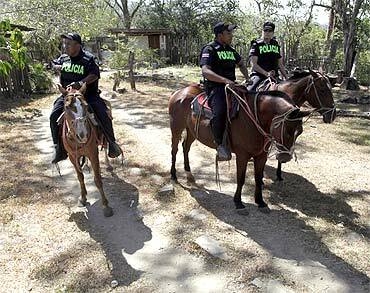 In 1996, the government formed Fuerza P blica, which keeps an eye on law enforcement, border patrol, and as an anti-narcotics squad. Thanks to a treaty signed in 1947, the country can look to as many as 22 countries for assistance, which also includes the United States. Trillions of dollars hidden in these tax havens!